The earlier a designer is involved in product development, the more added value is created. That is the lesson learned by Mikko Veikkolainen and Jari Kettunen of Kemppi, a manufacturer of welding equipment. “A modern welding machine is actually a computer equipped with a large power source,” says designer Jari Kettunen, who is responsible for user experience at Kemppi. When more software is added, usability takes center stage in design. For example, a Kemppi machine with an award-winning design has a user interface with a large font, which makes it possible for long-sighted welders to make out letters, numbers, and symbols without glasses. Kettunen thinks that a good user experience includes not only design and usability, but also the machine’s packaging and user manual. All of these elements have a crucial impact on the user’s first impression of the product, and on how quickly and easily the product can be set up for use. “If the first impression is negative, design and usability must be flawless in order to satisfy the user’s expectations. The role of user instructions is also changing. People today don’t have the patience to read traditional manuals – they want to be able to set up the machine using a simple quick-start guide and a few keyboard shortcuts,” says Kettunen. Kemppi is an industry pioneer in integrating design with its customer- and service-focused strategy. The company has employed in-house designers since 1998. Kettunen’s team is closely involved in R&D, on which the company spends nine percent of its revenue. According to Mikko Veikkolainen, Vice President of Research, Development and Innovation, design plays a key role at Kemppi, especially during the early stages of product development. “When defining a direction and concept for a project, the designer is the key member of the team. When the team includes software, mechanics, and electronics engineers, not having a designer is like trying to drive a car with three wheels,” Veikkolainen describes. Veikkolainen mentions invention disclosures as proof of successful collaboration between various professions. Kemppi’s R&D department is continuously striving to meet goals in three time frames based on the company’s strategy. The first goal involves raising the competitiveness of the current offering, with the related projects being implemented within a few months or a year. Projects aimed at complementing the existing selection are planned to last a year or two. Additionally, a certain number of projects are needed in order to create new solutions. “The resources for these projects are not necessarily very large at first. The idea is to perform tests and pilots. As many as five years can elapse between the first test and the product launch,” says Veikkolainen. For example, a quick charger for electric cars developed by Kemppi could lead to an entirely new offering. The product is ready, but no decision on production has been taken. “Now we know how a quick charger differs from a welding machine – very little,” Veikkolainen says jokingly. Meeting customer needs is central to design and R&D. “Whether you are designing consumer or industrial products, you need to think about the end user. If you forget how important the end user is, the project is likely to fail,” says Kettunen, who also has experience of designing consumer products. Kemppi defines the end customer as broadly as possible. “We have customers at three levels in various companies. Welders need user-friendly, ergonomic machines that are easy to move. For engineering managers and welding engineers, we want to offer quality management tools, as errors are costly. Executives want to improve competitiveness, and we can help by cutting down the hours required for welding production,” Veikkolainen explains. 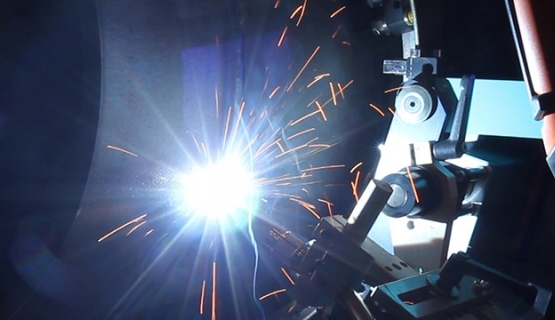 Since there is a limit to how much welding can be accelerated, additional work hours can be saved only by participating in the customer’s product design. For example, a customer in the shipbuilding industry is making a vessel in which the groove volume has been reduced to almost half the normal volume. “This means that less gas, wire, and time is needed. The outcome was not due to the software alone; the mechanical and arc control parts also played a role,” says Veikkolainen. Kemppi has three product lines that meet the needs of various customer segments. Light, portable welding equipment is used by maintenance men, for example, while mid-size compact machines are typically used by auto repair shops. Large industrial equipment is continuously used at permanent welding workstations in engineering workshops and the shipbuilding industry. Kemppi knows that finding out what the customer needs is not that simple. Requesting information works, of course, and daily feedback provided by salespersons is taken into account, but a more active approach is also required. “We have a systematic model for field research into the development of new products, which builds on the lessons learned over many years. Our multi-disciplinary team visits the customer and we place a heavy emphasis on our own observations. The things that, say, an electrician sees are different from what a welder or designer sees,” Veikkolainen notes. Kemppi’s R&D people have recently aimed to increase their co-creation with customers. The company has a carefully selected group of key accounts which is leveraged throughout the R&D process. This group is interviewed at the start of a project, and different prototypes are presented to them along the way. “In this way, we can ensure that we are doing the right things, while also engaging and motivating the group. Usability testing often forms part of this work. When the product is finished, these people are also excellent ‘internal salespersons.’ Since they have helped design the product, they also understand it better than basic users. They are able to tell their colleagues about the product and its features, and most importantly about why a specific function or feature is missing or works in a certain way,” Kettunen says. Customer focused business development can be learned in Aalto EE's Design Thinking for Business Innovation and in Aalto PRO's Service Design programs.